The best part of family research is that it is a work in progress. Daily, new collections, searchable databases, and even unknown papers are found, and made accessible to researchers. Seldom however, do genealogists get assistance researching their slave ancestors in a searchable, accessible database. 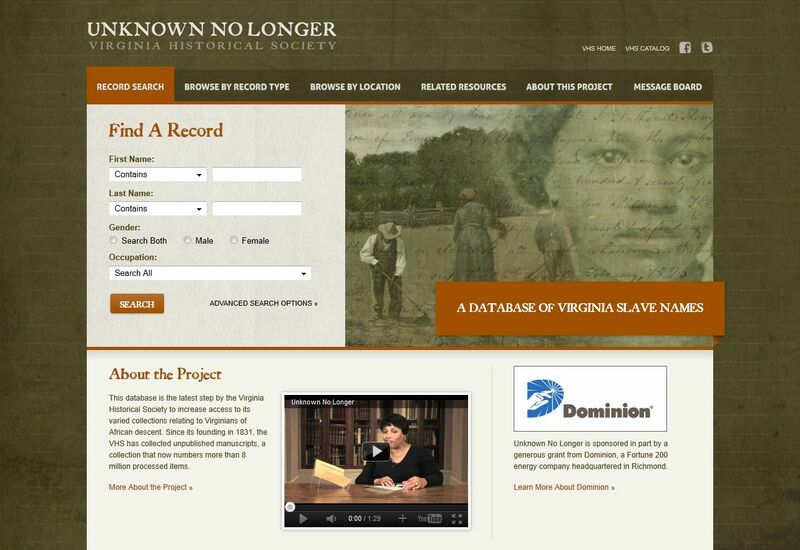 But the Virginia Historical Society of Richmond VA launched and is consistently updating a slave database: Unknown No Longer: A Database of Virginia Slave Names. It's not enough to say, my ancestors were slaves, or my ancestors were slave-owners. The digitized documents of Unknown No Longer will allow researchers to uncover a more complex ancestral story than that told by census records. This tool should be one more stop in your slave ancestry research. The Unknown No Longer Database is free of charge. Keep in mind, where there were slaves there were slave owners. This database will also allow researchers of slave-owning families to gain more information on their family history. As of today, there are approximately 1600 names in the database, 300 are slave-owners. Researchers may wish to use this database even if the slaves were removed to other states "... our collections contain plantation records, for example, kept by Virginians who moved to other states, taking their slaves with them."